Marina -solovilla is a modern designed triplex detached villa located in Oludeniz - Ovacik area. The villa is very private with a stunning mountain backdrop, it is situated in an area with neighbouring properties. Safe and ideally situated for a perfectly relaxing break. Perfect choice to have a holiday in a rental villa at ölüdeniz area. Marina -solovilla, features a contemporary large open-plan lounge/dining area that leads out onto the terrace, fully equipped large kitchen, three bedrooms (three en-suite) ,four bathrooms (three en-suite bathrooms), private swimming pool with plenty of space to relax and sunbathe, well manicured landscape garden and secured parking. The villa is 6 minutes drive away from the world famous Oludeniz Beach and 4 minutes drive away from the Hisaronu village where you can enjoy an abundance of shops, restaurants, pubs and nightlife entertainments. Villa accommodates up to maximum 6 guests. 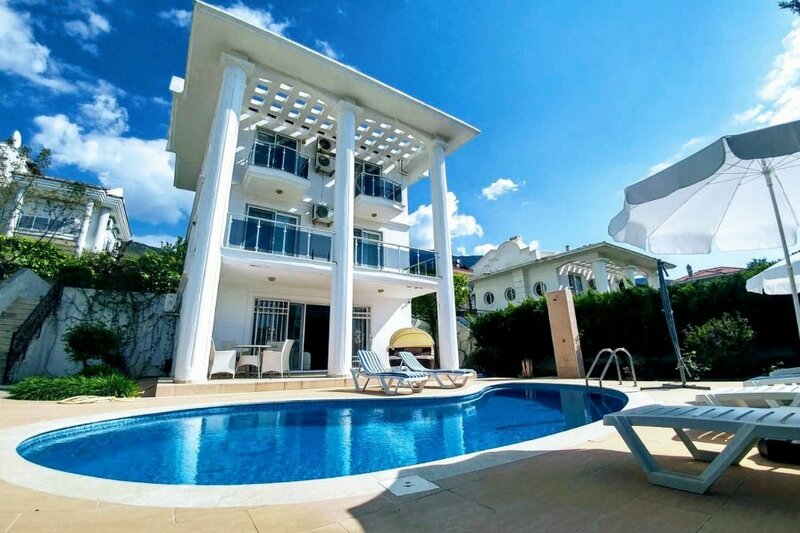 Get the adventages of renting property from the leading rental company Solo Villa and you shall have the best holiday on your vacation home. Olu Deniz (Blue Lagoon): 4 km, within 5 minute drive, 10-15 minutes with public transports.